Noble was on FOX’s long-running series, Fringe, and thanks to his friendship with that series co-creators (and creators of Sleepy Hollow), Roberto Orci and Alex Kurtzman, he’s now about to become a huge part of another sci-fi franchise. Noble recently spoke on a conference call about his role on the show and how he’ll become an even bigger part as it progresses, working with the cast and filming in North Carolina and his thoughts on guest-starring in shows like Hollow and The Good Wife. Sleepy Hollow airs on Mondays at at 9/8 central on Fox. Obviously you have a long history with Alex and Bob. How did they approach you about coming onto Sleepy Hollow? John Noble: Alex ringed me and, no, that’s not true. I got a think a call through my management first and then Alex contacted me and we took it from there. He ringed me in Australia, I was in Australia. What can you tease about your character? John Noble: Oh, what can I tease? It is interesting isn’t it that the episode is called “The Sin Eater” and it introduces this character of Henry Parrish, he’s a reluctance sort of a savior, but he has this ability, in a sense, to remove evil from a person; and hence the name, The Sin Eater. I’ll tease you with that much, that even though he doesn’t want to, he’s called into action basically to save Ichabod’s life and he does. So that is our first introduction and we establish a relationship that you can see that there is some sort of chemistry between him and Ichabod and the other principals. So that is the tease. What else do you want to know, Marisa? What was your favorite part or moment of filming the show so far? John Noble: You know it’s funny, the kind of favorite moments, believe it or not, are the first time that the character is exposed. No one has any idea who this character is, and in this situation it’s a knock on the door. And I haven’t seen the footage, but I imagine that it’s just going to be one eye looking out through the door. And that kind of really creepy good moment; who is this new person, and then, of course, we open the door and meet Henry. I only had two scenes, I think, in the episode, but they were two very big scenes and both of them were beautifully written so I enjoyed it. But really, the first instruction was my favorite moment I think. What do you find that’s so unique about Henry Parrish. John Noble: What’s happened, and I thank Alex and Roberto for this, he’s another one of these really complex, multilayered characters. When I did Walter Bishop, the great joy of him was the layers that he had and it gave me so much room to play with the psychological levels of the character and Henry offers me the same. And from what I’ve been told by the writers that’s what we’ll see as time goes by. That makes going to work a joy for me to play with these complex characters, so that’s the main thing. Will Parrish be in quite a few of the upcoming episodes? 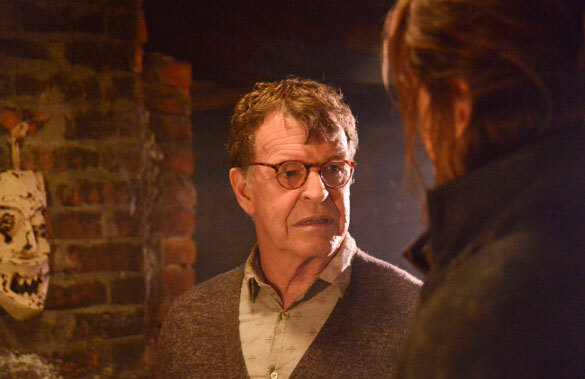 John Noble: Yeah, well I’m going to do three more this season. So I’ve done one and I’m going to do three more, so that’s three out of four actually of those that are left; and then probably be back next year for quite a lot. You mentioned your new character has lots of layers, a bit like Walter Bishop. How different is Henry from Walter, because Walter is a very, very eccentric. Is Henry also quite an eccentric character do you think? John Noble: Yeah, absolutely, but not in the same way. He doesn’t have that, as I know so far, that extreme range that Walter had, the sort of mentally damaged character that he was. He doesn’t, from what I know I don’t see that type of range. What I do see is the depth and the secrets and the psychological twists that I find very appealing about this character. He’s a mystery man and we will reveal these mysteries. And I think as time goes by, those revelations will be quite a shock to the other characters and to the audience. That’s great fun to play that sort of thing, but he’s not a crazy like Walter was. Do you enjoy guest spots on shows like Sleepy Hollow and The Good Wife after being on Fringe for five seasons? John Noble: The, yeah. I’m just actually in the process of shooting a guest on Good Wife this week. Yeah, well, yeah because I already know a lot of the people anyway. Do you know what I mean? So it’s great to come in and to work with good actors. This time I am working with Julianna Marguilies and Josh Charles. I know them; they are great actors, so that is a joy in itself. It can be difficult doing guests. The one with Sleepy Hollow is more than a guest. It’s not like a one-off where you come and your job there is to serve as a plot device, which is what a lot of guest actors have to do; there is a growth in this one. But sometimes guest acting can be very difficult I think, and in the past I’ve found it’s tricky, but not at present. I’ve done a few in Australia this year and they have been great. Sleepy Hollow shoots in North Carolina. What has that been like shooting down there for the show? John Noble: Well, I’ve only shot one episode so far. It’s a beautiful little town called Wilmington; gorgeous beaches and lovely old, pretty old historical part of the world so, so far my first impressions that it’s a terrific place. But as I’ve said I’ve only shot the one episode there. What has that experience of going from one really big fan show to now joining as a recurring guest on another one? John Noble: It’s like getting lightning in the bottle twice, if you can understand the analogy. I know that there is a cross-over between these two shows. To start with, the creators, Roberto and Alex, are the common link. I know from just talking to fans over seven years, going back to Lord of the Rings through those years at Fringe, that there is a huge cross-over within these science-fiction fantasy areas. So I feel very comfortable in that area, very fortunate in a sense to have that stable base out there of people that I know enjoying and find it fascinating if it’s good. You talked about getting the call to do this show, but was there something specific in the script or what were your first thoughts when you read about this character? John Noble: I knew the evolution of the show because I had remembered talking to Alex and Roberto last year. They came up with a 100th episode party for Fringe and we were talking about, and they said they have this new show, and actually said to me, would you come on and do a guest role in the pilot? We just talked. Anyway, nothing happened. So as a result, I had an interest in the show and the fact that they were doing it that was the main, sort of, the start of it. The premise, probably one of my favorite reading topics is history, early American History would be at the top of that list, so when you start to deal with, this is about the Revolutionary War, you know, I mean I find the whole period absolutely fascinating and have read widely on it, and so that would be enough to make me watch it anyway or to be interested in it. But when you link it in with this extraordinary legend that was written in, what 1826 or something, when Irving wrote the book, I can’t remember exactly, this American legend that is so rich and potent, it’s almost like a perfect combination. What kind of things do you watch when you have time? John Noble: I watch an awful lot of documentaries and science shows. I tend very strongly towards documentaries. The shows, and when you’ve got time, is absolutely the, I watch the Good Wife; I have to say, I’m not saying that because I’m on it at present. We’re watching, I’m just trying to think what we’re watching, Penny, what are we watching at present on tele? Yeah and what is the only one we watch, I’ve got to find out from my wife. I used to enjoy Fringe. No, there is another one, I just can’t think of it. Homeland, we watch. You’ve been in a lot of genre shows. I’m just wondering if there’s a specific franchise that you would like to be involved with. John Noble:You’ve been reading the rumors about Stars Wars, have you? I have not, I just thought I’d ask a different question, just to shake things up a bit. John Noble: No, the big franchise is going to open up is Star Wars, we know that. I mean that would be a dream if you got that. I don’t know, I’ll just say the one at this stage; it’s not that I would certainly consider other things but, Star Wars is the one that appeals to me most. Can you talk more about working with Nicole Beharie and how that experience was? John Noble: Absolutely, she’s such a pro, she’s so prepared. You know? You’ve heard that term used I’m sure when people are so prepared when they come to work. So it is very easy to engage very quickly and at a quite deep level with actors that prepare like that. She’s gifted, that goes without saying, I think. But I enjoyed very much, and I am really looking forward to doing more work her as well. I just got a sense that we’ll probably develop something quite special. I don’t know, that’s just a guess at this stage, but my sense was that we can develop some quite interesting chemistry and that was based on what I have already done with her. I have great respect. Can you tease us with anything else about your Good Wife appearance? John Noble: Well, it’s, I didn’t appear until earlier, it was kind of a flashback take about a really nutty Australian bloke. But in the episode, it was a flashback, but he was shot in the back of the head in that episode. When I was doing it, they were saying, oh we’ve got to have you come back. I said I can’t because you’ve just killed me. They brought him back more in for more interplay with Alisha, so it’s a lot of fun. I love working with these guys, they are such good people. And the crew of the Good Wife, so many of them were the crew in our first year of Fringe in New York, so it’s like being back with family. When you guys were through filming, did you and the rest of the cast hang out together afterwards and talk shop? John Noble: Oh. Well I’ve only done one episode so far, so no, I mean we, you sort of sit around and get a bit of talking done in between shots. But I didn’t think I was living anywhere near those people, I was just in some accommodations somewhere and ah, so I didn’t see them often. But I’m sure that as time goes by, because I’m now going back for a slab of them, I’m sure we’ll get to know each other much better and I’m looking forward to that too. We hear stories about actors finding their characters and they will say something like, “Once I had the walk, I knew who he was” or “The moment I put the hat on, I knew who he was”. How do you find Henry? John Noble: Kind of the best place to go for these characters is to the script very often. Seriously, I read it, I don’t know how I absorb things, to be honest with you, but I do and I just absorb them. I don’t over read it and I don’t really ever spend much time learning them. But, apparently, they just sit around in my ahead, according to my wife. Then there is hope, you know, you go and see what the costume is and so forth and you discuss possible costume looks and hair and make-up looks. I don’t know, some things are obvious, some things you wouldn’t dream of doing. So I don’t have a, you know if I don’t get the walk right, I know what you are talking about, and I do hear some actors say that but that’s not the way it is for me. It’s not one single thing that does it, it’s more the internal chemistry and then that sort of comes out into whatever he looks like and however he walks and sounds and the voice he uses. There are things like, I do always do some research on to how he speaks and so I certainly spoke to the writers at length as to what accent he may have. That tells you a great deal about things sometimes, you know, and so we decided on that. But no, it’s quite an organic process actually. Is there one thing about Henry that you like a lot more than other aspects? And is there, you’ve done characters that are kind of broken in an odd way and you make them sympathetic. Is there something like that about Henry, I mean aside from the fact that he is a sin eater? John Noble: Yeah, there is. You know, it’s a funny thing, when you play any character, you know how we are sympathetic towards ourselves? No matter what we do or what we say, there is a certain amount about ourselves that we love or else we wouldn’t get up in the morning and keep breathing. So for me it’s when I take a character on board, I like them. 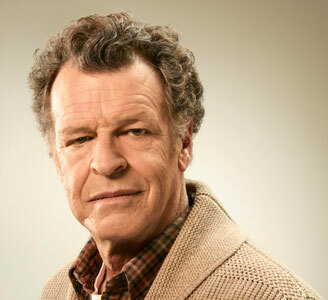 John Noble doesn’t always agree with them, but the character understands what he’s doing and he believes that he’s doing the best thing by making the best choices. I think if someone is honest like then it’s easier to sympathize with them or empathize with them, it’s very human. There are certain aspects of that, that I can see looming very large in this Henry character.